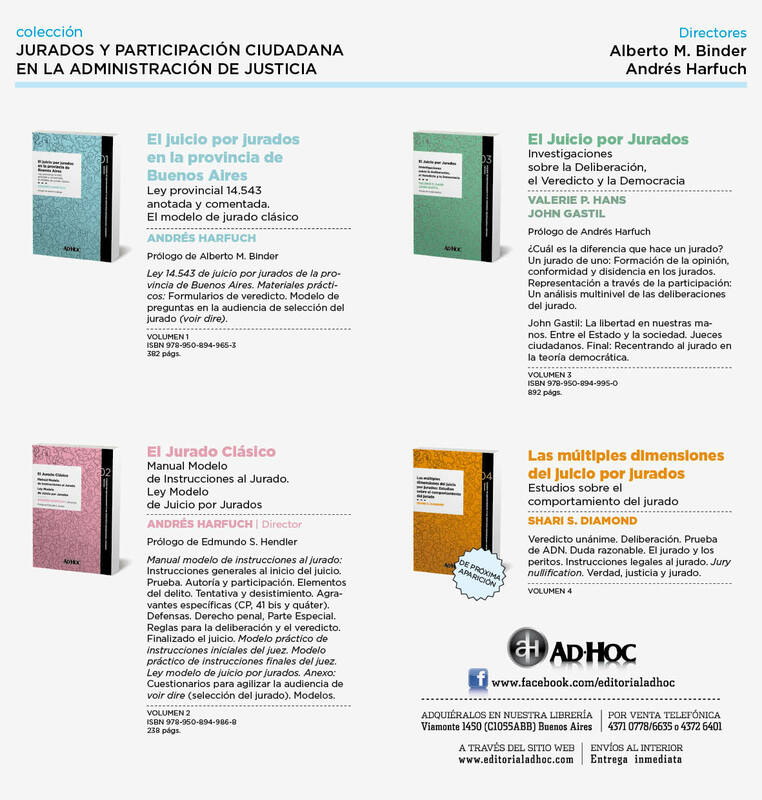 Asociación Argentina de Juicio por Jurados: THE REVOLUTION OF TRIAL BY JURY IN ARGENTINA. The butcher, not guilty. 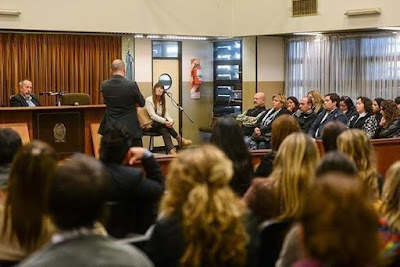 THE REVOLUTION OF TRIAL BY JURY IN ARGENTINA. The butcher, not guilty. Nothing will be the same for Argentina´s judicial system after the butcher, Daniel Oyarzún, was acquitted by a unanimous verdict of not guilty. 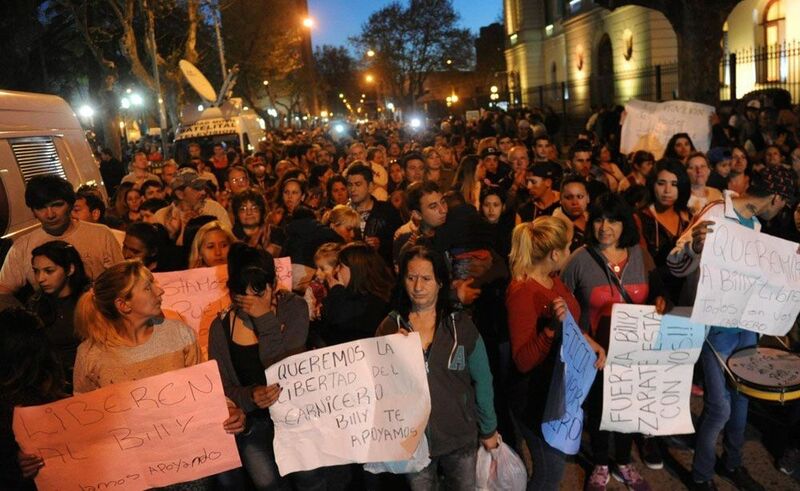 Today, the butcher´s case and trial by jury are all that people are talking about in Argentina. It is a true revolution. Trial by jury has gained overwhelming support in public opinion and its rapid extension to the whole country is a strong possibility in the foreseeable future. This level of excitement and support for the trial by jury system has never occurred in Argentina, not even after the famous guilty verdict in the Farré case (The whole country is talking about jury trials). People are excited to talk about the new values that the jury brings to justice: common sense, fairness, unanimity, the impressive number of twelve jurors that directly represent the community and the finality of the verdicts. 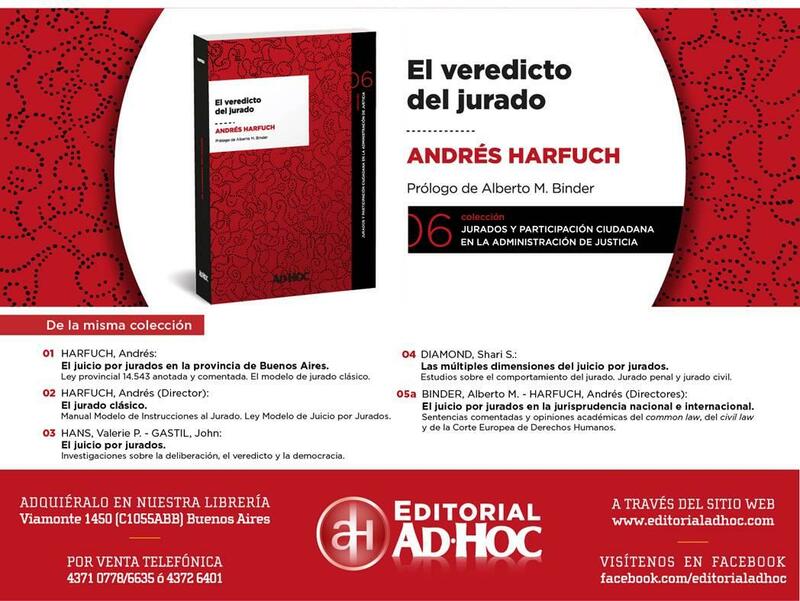 From frontcovers and editorials in the main newspapers, to central themes on the TV's highest rated programs, to collapsed social networks, to statements of support from the main political leaders and intense discussions in favor or against the verdict, the entire country is talking about jury trials as the democratic revolution for the Judicial Power in Argentina. In short, the verdict of the jury in the butcher case caused a political earthquake. The popular radio journalist Tato Young issued a column of opinion that synthesizes this debate that has now spread to the whole Nation. Its title says it all: "Jury trial: The great chasm between judges and citizens" (listen). The facts that the jury found are: Oyarzún was working in his butcher shop in the city of Zárate. Two armed robbers threatened him with a revolver, robbed him 5,000 pesos, fired twice inside his store and fled on a motorcycle. Oyarzún went out to chase them in his car at full speed, while the perpetrators shot him five times more. The bike made a bad maneuver, lost its balance, fell to the ground and Oyarzún rolled over and killed one of them, Brian González. A neighbor filmed a video with his cell phone showing the thief dying on the ground, crushed against a lamp post by the car. In the most dramatic scene of the trial and the one that seriously complicated his legal situation, the video also shows a the butcher and several neighbors beating them with sticks. Brian Gonzalez died hours later at the hospital. The other thief was caught and was sentenced to 6 years and 8 months in prison. Oyarzún was immediately arrested on the charge of manslaughter. Thousands of neighbors marched to the City Hall to occupy it, demanding the butcher´s immediate liberation. The case hit the country in such a way that President Macri himself asked for Oyarzún’s freedom. Finally, after three days, he was released on bail. But the prosecution insisted and continued to charge him for manslaughter. 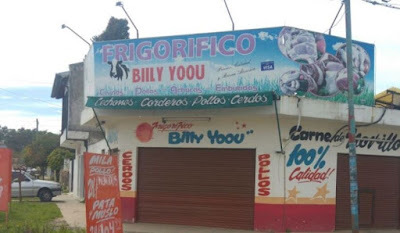 Neighbors occupy the City Hall: "Free Billy the butcher"
His case shocked Argentina and once again raised the debate about the limits of self-defense when someone is assaulted violently by armed robbers. Should you react to a theft? Is the thief's death justified? Is the butcher a victim or a perpetrator? 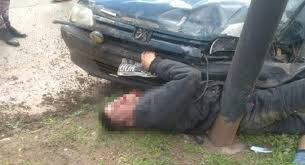 Oyarzún chose to be tried by a jury of his peers, as is his constitutional right in the new jury system in the province of Buenos Aires since 2015. The decision to go to a trial by jury completely altered the social resonance of the case. He faced charges for manslaughter (8 to 25 years in prison) and for the minor offense of disproportionate self-defense (1 to 5 years in prison). He claimed self-defense. The whole country was in edge for several days, wondering what the jury would do: Would it convict Oyarzún as a murderer who took punishment into his own hands? Or would it acquit him for having legitimately defended his property from an armed robbery? The trial lasted four days and there were moments of extreme tension. The public prosecutor, the private prosecutor and the defense attorney presented all the evidence, discussed everything openly and gave all their statements to the jury. The judge properly instructed the jury about these three options. ""We, the jury, unanimously find Daniel Oyarzún not guilty"
From that moment on, the country was swept up in a debate like no other. The verdict gathered the overwhelming support of the majority of the population, always sensitized by the State´s 20 years of failure to control violent crimes. An vast social majority that is fed up with crime delivered this clear message with the verdict (Judge Mario Juliano opinion). But the decision of the jury also received strong criticism from left-wing sectors, who see this verdict as a more emotional than technical decision and almost a license to kill (Santiago Cantón opininon). In the middle, there was also room for lucid opinions of judges and politicians in favor of respecting the decision made by the jurors, provided by our National Constitution. "A jury has spoken, they said. We must learn to listen to the profound political, social and judicial messages of their verdicts". To recognize that, in short, judges and juries agree on their decisions 76% of the time. Judge Mario Juliano: "The jury trial is the trial that the Constitution wants and we must all respect that in the same way that we respect the voice of the People in the elections"
Ricardo Izquierdo, the butcher´s attorney, praised the work of the jury, which he described as "very strict" , because "it assessed all the evidence and listened to all parties. Trial by jury is really working in this country". Carolina Píparo, representative for the province of Buenos Aires, and who years ago lost a baby after being the victim of an armed robbery, stressed that the butcher that day "did not get up with the intention of killing anyone and the jury understood it that way. Common sense prevailed. Justice was served." Germán Garavano, National Minister of Justice: "We are pretty much in favor of jury trials. There will always be verdicts that please and others that please less. It is a process that will take time. It is a collective construction of society. But the attitude of the butcher is questionable and as a civilized society we have to reject it." Domingo Rondina, Human Rights lawyer: "I am a strong supporter of jury trials. It is a procedure that can sometimes satisfy us more or less, but it directly links the citizens with justice. I don´t like this verdict at all, but the jurors who participated in the case have the same ability as a judge to find the facts after a real deliberation. On the other hand, this case does not differ in any way from certain terrible verdicts of bench judges." Gabriela Burgos, representative and president of the Constitutional Affairs Comission: "Apart from the outcome, what we must highlight is the improvement in the procedures to arrive at the decision. The verdict has been rendered unanimously by the juries based on the evidence offered by the parties and the public debate that took place. First, during the opening statements, then the evidence produced at trial and, later, in the deliberation of the jury." Sidonie Porterie & Aldana Romano (INECIP): "We may not like the decision reached by the jurors in this case, but what cannot be said is that it was arbitrary". Horacio Cecchi, journalist for Página 12 : "The issue is not whether it was a jury or a judge. That does not matter. Any of the facets of justice that exist today tend to be functional to this criterion of reality: you can smash with your car to recover your money, you can kill in self-defense". Mariano Borinsky, judge of the National High Court of Appeals: "The jury trial is extremely valuable, and if you accept to be judged by peers, you must accept the verdict even if you do not agree. This institute comes from the Anglo-Saxon common law and is based on the right of the accused to be judged by their peers or neighbors." Daniel Scioli, former governor of Buenos Aires province: "I am very proud of having established jury trials during my second term as a Governor in the Province of Buenos Aires. Its implementation has been pending since the Constitution of 1853 was enacted. It is a real and effective facet of democracy inside the judicial system." 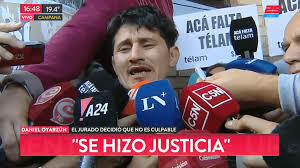 Patricia Bullrich, National Minister of Security tweeted: "The butcher Oyarzún was released after a historic trial by jury. His acquittal is a true act of justice: the 12 members of the jury decided to release him unanimously, after considering that he was a worker who had only defended himself from crime." Eduardo Castilla, leader of the Workers' Party: "The butcher was acquitted. This decision gives air to a right-wing climate that focuses everything on the small crime without questioning the country's great looters."